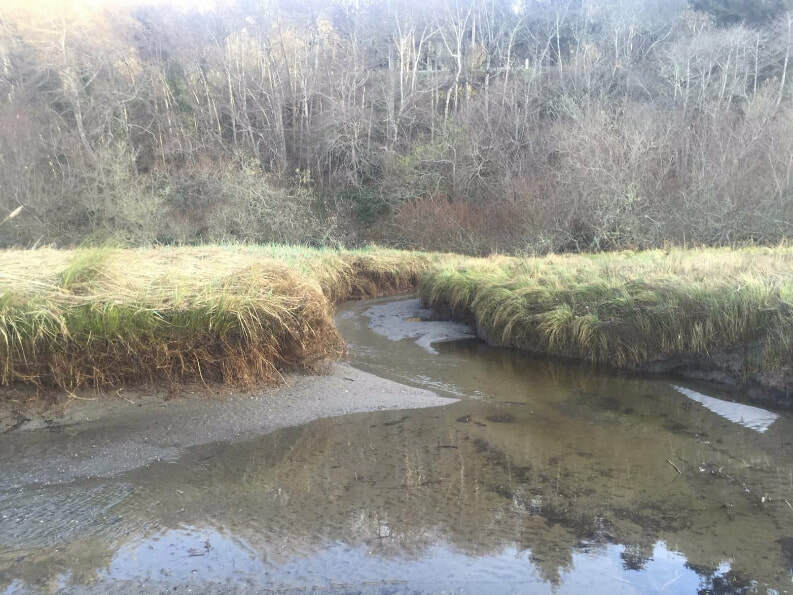 ​The Land Trust’s ‘Little River Trail’ property is a 15-acre parcel above Moonstone Beach and the Little River estuary, at the south end of Scenic Drive. This property adjoins the Little River State Beach parcel is waiting to be the future home to Humboldt County’s newest segment of the California Coastal Trail. We are seeking funding for a new trail and pedestrian/ bicycle/ equestrian bridge to be constructed across the Little River. 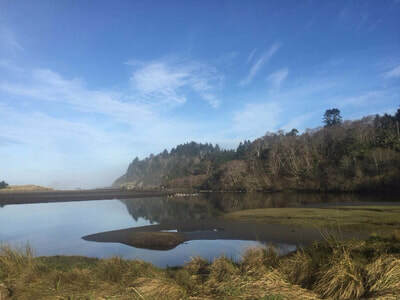 This new trail will connect the existing Hammond Trail in McKinleyville to Trinidad’s scenic coast and public trails. 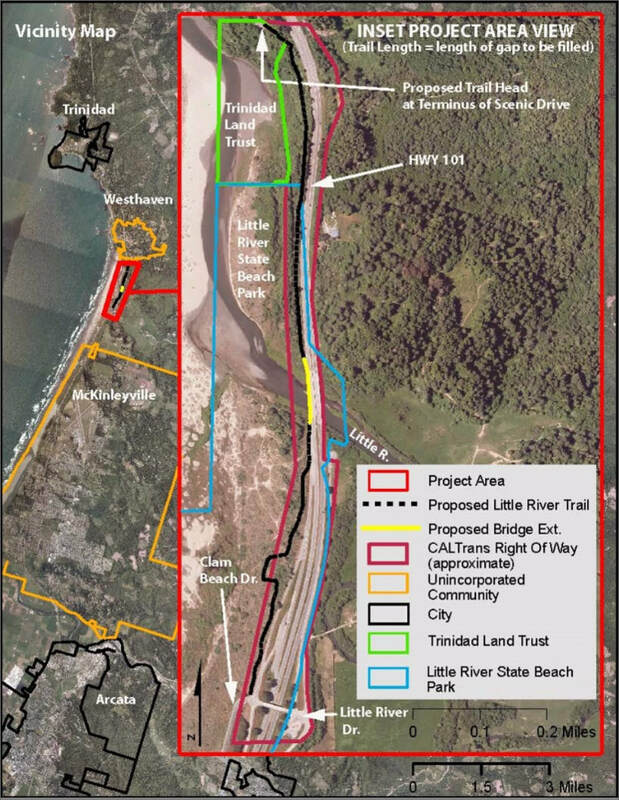 Bicycles will finally be able to ride off the highway along the coast through Trinidad, from Patrick’s Point to Clam Beach. This proposed trail project has a detailed state-funded feasibility study complete and is supported by key partners such as the City of Trinidad, Humboldt County, Humboldt County Association of Governments, State Coastal Conservancy, CalTrans, the Trinidad Rancheria, other agencies and many outdoor trail enthusiasts. Thanks to Revolution Bikes for sponsoring our bicycle raffle fundraiser. This trail project is currently in need of funding for Phase 1: environmental engineering, design and permits. Our 2016 public agency grant application for $1.8 million was denied. Currently this project has local government partners but no Phase 1 funding. Still, the trail route and public access is secured. We need more public support, political support and a state/federal program grant. 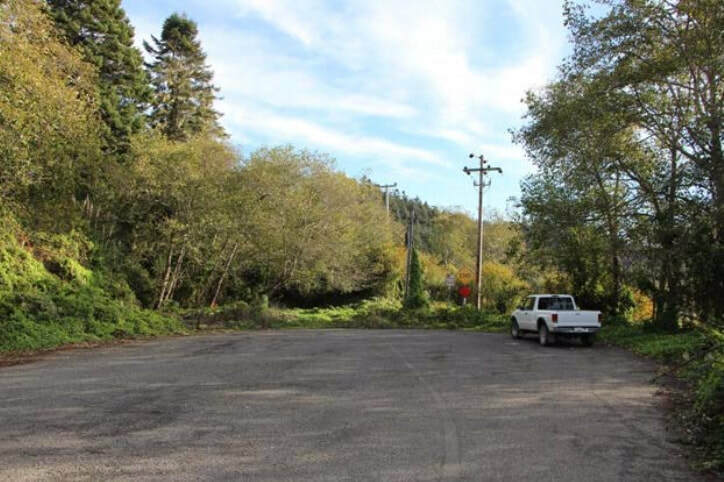 Phase 2 will be trail construction, including a cantilever pedestrian bicyclist bridge adjacent to the existing Highway 101 bridge crossing Little River. View the Trail Feasibility Study on our website. 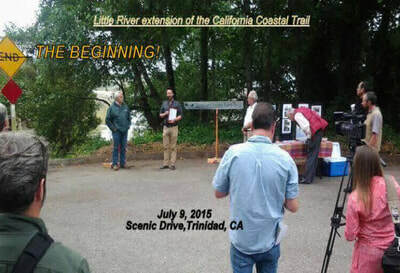 You can support our work to complete this project by making a donation to the Little River Trail fundraising campaign. 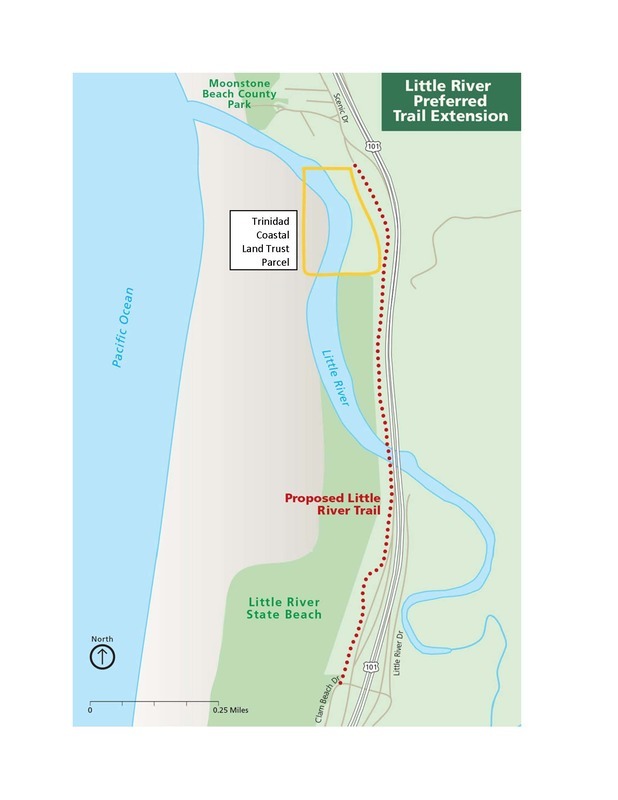 ​To prioritize and fund this proposed section of the California Coastal Trail, connecting Hammond Trail at Clam Beach to Trinidad's Scenic Dr.
2018: CalTrans takes project lead and submits 2018 ATP grant; ATP grant declinded. One out of nine local government ATP proposals accepted. ​It will not be cheap. 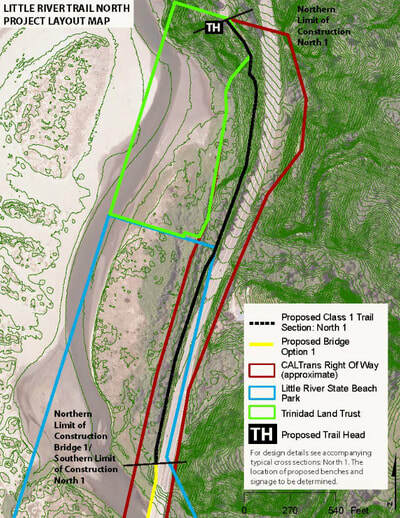 The bridge crossing alone is estimated to cost $2.5 million and the trail extension's total cost could reach $4.5 million. 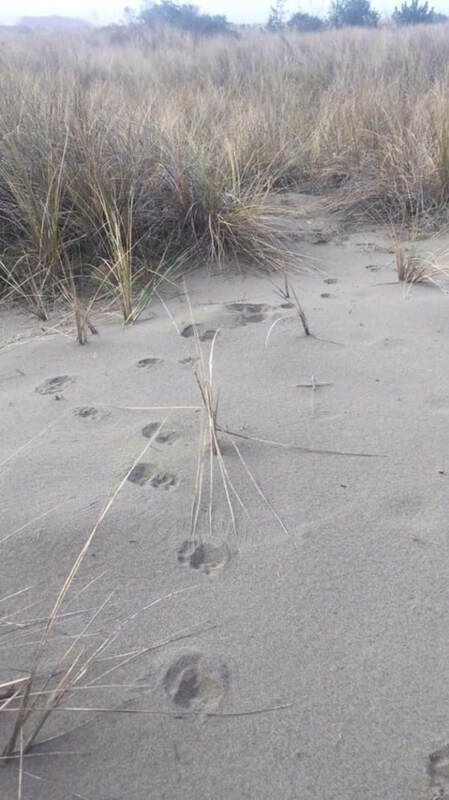 And finding an agency willing to take responsibility for the trail's operation and maintenance, a step that has to be taken before funding is secured, is proving to be a challenge.